The sommeliers who participated in the Annual Meeting of the UAES (Spanish Sommelier Association Union) which was held on 27-28 February 2017 in Bilbao, organised by the Sommeliers Association of the Basque Country, dined in our headquarters of Mendibile on the evening of 27 February. 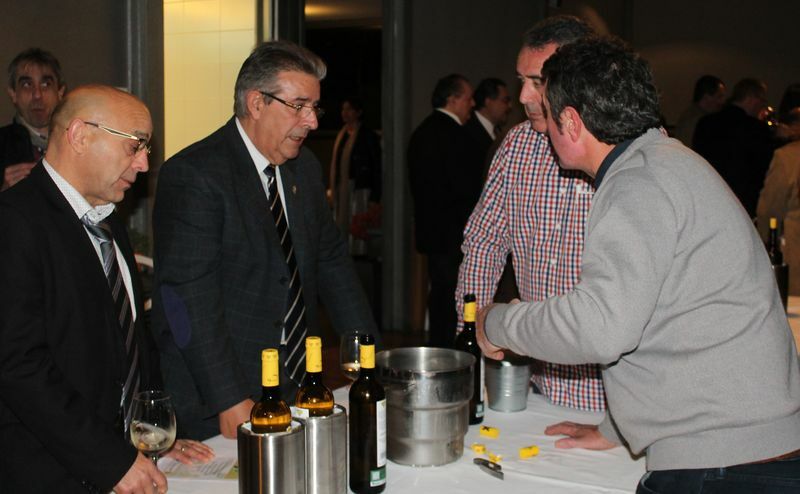 It was a wine pairing dinner in which approximately fifty professionals from all over the country were able to taste the following twelve txakolis of our AOC, previously selected by the candidates for the Sommeliers Championship of the Basque Country held in February: Amunategi (2016), from the Anton Aranburu winery; Berroja (2015), from the Berroja winery; Bikandi (2016), from the Miren Bikandi winery; Bitxia (2016), from the Talleri winery; Erdikoetxe (2016), from the Andoni Ojanguren winery; G-22 (2013), from the Gorka Izagirre winery; Gorena (2015), from the Abio winery; Itsasmendi 7 (2013), from the Itsasmendi winery; Lexardi (2014), from the Bizkai Barne winery; Magalarte FB (2015), from the Iñaki, Andoni Aretxabaleta winery; Mendraka (2015), from the Elizalde winery, and Señorío de Otxaran (2016), from the Virgen de Lorea winey. The menu consisted of Cantabrian anchovies on bread with Extra Virgin Olive Oil from the Rioja Alavesa; Cantabrian tuna with pickled Zalla onion; Cream of Bean soup with Ibarra chilli; Txakoli and tumeric stewed chicken with corn crunch; Veal skewer with mushrooms and peppers; and Cheese with farmhouse nuts.